Jill Clark knows how the worlds of real estate and beauty go hand-in-hand. A former vice president at cosmetics giant Estee Lauder, she successfully leveraged her expertise in marketing, business acumen and retail knowledge to launch her brokerage career 14 years ago. 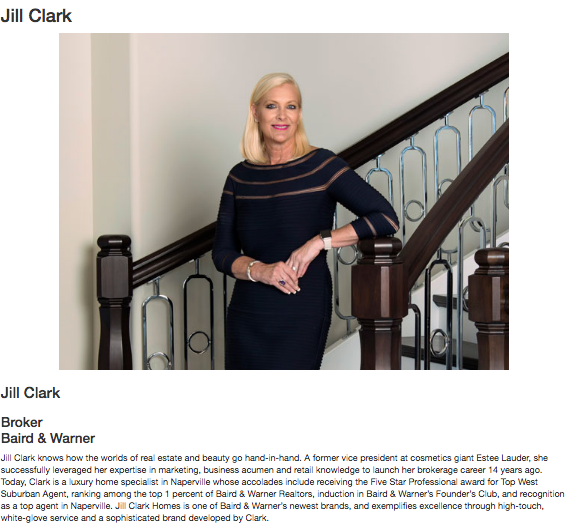 Today, Clark is a luxury home specialist in Naperville whose accolades include receiving the Five Star Professional award for Top West Suburban Agent, ranking among the top 1 percent of Baird & Warner Realtors, induction in Baird & Warner’s Founder’s Club, and recognition as a top agent in Naperville. Jill Clark Homes is one of Baird & Warner’s newest brands, and exemplifies excellence through high-touch, white-glove service and a sophisticated brand developed by Clark. Read the full article.